Jeff Nelson got sent back to the minors in 1994 and he didn't like it. Finally, in June, he asked to be traded, according to McClatchy News Service..
"I wasn't happy about going down," Nelson told the news service after finally getting called back up that July. "I didn't feel I belonged in AAA. You don't like it so you start to say things." The reliever had been a major league regular with Seattle the previous two seasons, getting into at least 66 games each year. That stint in the minors ended up being his last extended tour there. Nelson went on to play in a total of 15 major league seasons and one all-star appearance. That all-star appearance came a year after Nelson voiced his displeasure in another situation, getting passed over in the previous mid-summer classic. Nelson's career began in 1984, taken in the 22nd round of the draft by the Dodgers out of Catonsville Community College in Maryland. 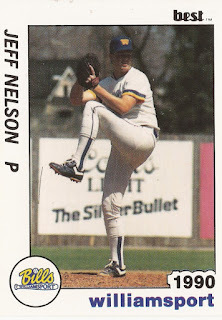 Nelson played his first year as a 17-year-old at rookie Great Falls and in the Gulf Coast League. He made single-A Bakersfield in 1986 and AA Williamsport in 1989 after moving to the Mariners system for 1987. In 1991, he made AAA Calgary. Then, in 1992, Nelson's ninth season as a pro, he made Seattle. He got into 66 games for the Mariners that year, getting a 3.44 ERA. He bested that in 1993, getting into 71 games. In 1995, Nelson and the Mariners went to the playoffs. Over six games that postseason, including three against the Yankees, Nelson had a 2.08 ERA. That off-season, Nelson became a Yankee, getting sent along with Tino Martinez. He then went back to the post-season in each of the next six seasons, winning four World Series. "When we acquired him, I'm sure that had a lot to do with it," Yankee manager Joe Torre told The Baltimore Sun in October 1996 of Nelson's playoff success in 1995, "but I also heard from a lot of other managers -- like [Milwaukee's] Phil Garner -- who said, 'You got a good one.' "
Nelson topped 70 outings in three of his five seasons in the Bronx. In 2000, he went 8-4 in 73 outings with a 2.45 ERA and helped the team to another World Series championship. That July, Nelson thought he'd played well enough to get an all-star nod but Torre passed him over. Nelson complained and a bad second-half stretch resulted in Yankees owner George Steinbrenner saying Nelson should "put up or shut up," according to The Associated Press. The next July, though, Nelson was in. It was his only all-star appearance and Torre was the one who chose him as a replacement. "It was hard to believe," Nelson told The AP. "You don't expect it. It's exciting." Nelson continued playing through 2006, playing for the Mariners, Yankees, Rangers and White Sox. He threw his final pitch in 2006. When he was done, he had a total of 798 major league games, a career ERA of 3.41, four World Series rings and that one all-star appearance.